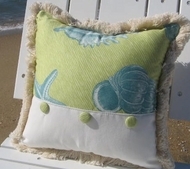 Made exclusively by us right her in America our Seabreeze Coastal Pillows Features Seashells on fine quality cotton in shades of Sea Green and Turquoise blue, trimed with a lush cream cotton. 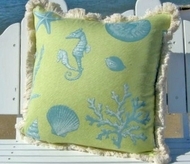 Our small Turquoise pillow "My favorite Beach House" is embroidered and trimmed with piping. All proudly Made in America.